Riding the rail … a “rails to trails” trail, that is. These tadpole trike riders are on the Nickel Plate Trail in north central Indiana. The name comes from the former railroad track bed the trail was built on. It was the Nickel Plate Railroad. I have ridden on ihis trail once myself although this particular part these guys are riding didn’t exist at that time. Apparently they started their ride together at the Victory Bike Shop in Kokomo, Indiana. Where these guys are riding is about 75 miles from where I live. I don’t know if these guys are a part of the group of tadpole riders who have an organized group in the nearby area, but I would not be surprised if they are. I know I would be if I lived closer. (That is, if they would have me). From what I have read they usually ride together on Thursdays and ride all day long up until evening. They often ride about 100 miles. At least that is what I read. That is a lot of riding. I am envious. Other than my one friend there are no other tadpole trike riders in our area that seem to show much interest in getting together for a group ride. Watching this video I would say that it looks like these guys are enjoying themselves. I would like to be with them. How about you? Some people are loners by choice while others are because they have no choice. I am hoping things change around here where I live and other tadpole riders start riding together. 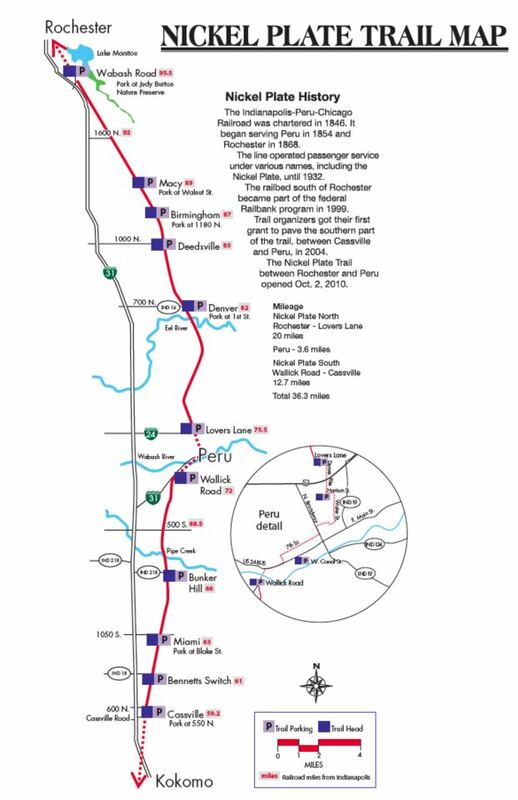 If anyone is interested in checking out the Nickel Plate Trail HERE is a link to their website. And HERE is the TrailLink website page on this trail. HERE is the IndianaTrails webpage. HERE is their Facebook page. Lastly, HERE is an article about the trail. Victory Bike Shop in Kokomo, Indiana produced the following video showing a mechanic installing a Schlumpf High Speed Drive in a Catrike Road tadpole trike. He sure makes it look easy. Yep, that’s a hole in one alright. I have “been there” before. A few years ago one of my fairly new Schwalbe Tryker tires I was trying out got damaged when the sidewall ran into something and my tire was pretty much ruined. Later at home I placed a “boot” inside of it and got some additional miles out of it. I don’t recommend this, but I did it as I was rather disturbed over the fact that I had so few miles on the tire when it happened. For what it is worth I am not impressed with the Tryker tires because of this issue of the delicate sidewalls. Many others have said the same thing. 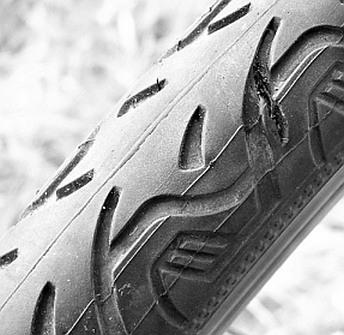 Anyway, what I want to talk about here is one of those “what ifs” … namely what if you are out riding and a tire gets damaged like this … what do you do? Most of us don’t carry around spare tires … well maybe lots of us do, but I am talking about tires for our trikes not extra weight around our waist. 🙂 If the inner tube is bulging out thru the sidewall or road surface of one of our tires we have a concern, a problem. It is not a good idea to try to ride on a tire like that. It most likely will result in further damage and failure. We will find ourselves broke down alongside the road or trail. So what do we do? 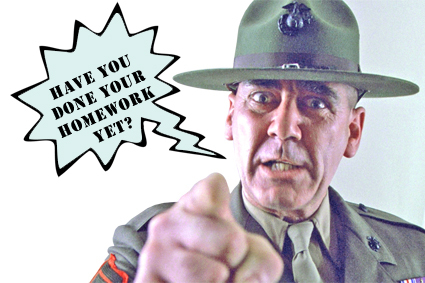 Our Uncle Sam can come to our rescue. Just pull out a $100 bill or if you don’t have a $100 bill you can use five $20 bills. I am only kidding. 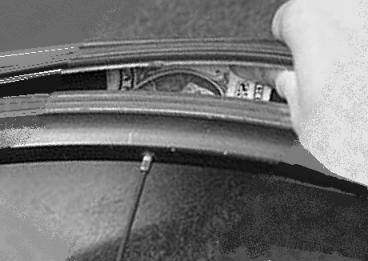 Take out a $1 bill and depending upon the size of the damaged area of the tire you may be able to fold the $1 bill before placing it as a boot on the inside of the tire over the damaged area. You don’t want the boot to be too small or else it could be forced thru the hole rather than keep the inner tube where it belongs. Our dollar bills aren’t worth the paper they are printed on anyway so it is not a big thing to use one for this purpose. If you have a tire which the inner tube is forcing the cut or hole to open further than you need to use an emergency tire boot of some sort. If you have high pressure tires it would be a very good idea to reduce the pressure in the tire down to it’s minimum pressure so that there won’t be as much force from inside … trying to get outside. 🙂 You may even have to reduce the pressure even lower depending upon what things look like as you air the tire back up. Mind you this is a temporary patch job just to hopefully get you back home, or to your vehicle, or to a bike shop where you can replace the tire. By the way, I know that U.S. paper bills work in this application because of the way they are made. I have no idea how the paper currency of other nations are made so unless they are made quite similar to U.S. paper bills I don’t think they would do the job. 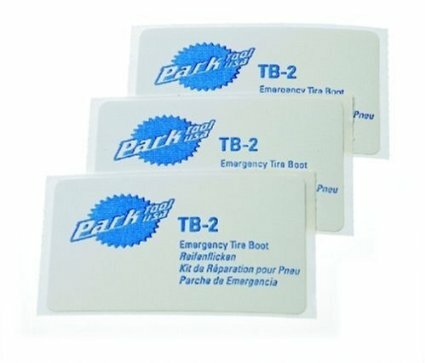 They do sell emergency tire boot patches which one could carry with them. I don’t know anything about them as I have never even seen one much less used one. 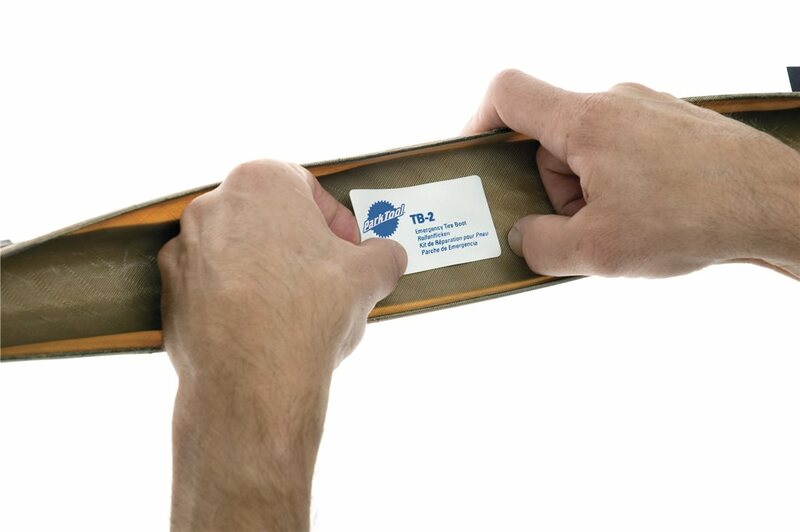 ParkTool’s TB-2 emergency tire boot is probably the best known available. 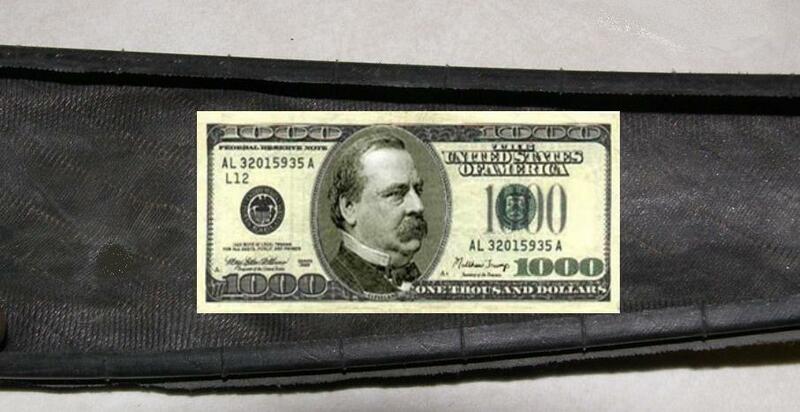 But if you don’t happen to have one of these available just remember the $1000 bill (or ten $100 bills) trick. Just pull one out and … Did I really say that? I came across this video and thought you might enjoy it. This Korean man is getting quite a workout with this hand crank trike. 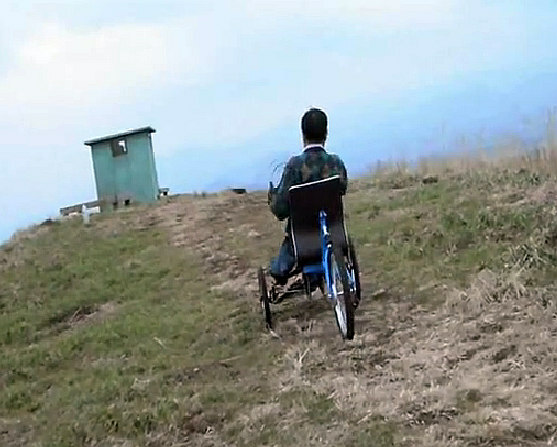 As he rides along and the small building comes into view I couldn’t help but think “that is a lot of hard work just to get to an outhouse” (outdoor toilet for those who are too young to know what an outhouse is). Then the joke came into my mind … 50 paces to the outhouse by Willy Makeit. For the benefit of anyone who doesn’t know and understand what I am talking about here … Willy Makeit translates into “will he make it” … as in will he make it in time. Anyway, I certainly commend him as that is quite an undertaking. I certainly would not want to be coming down that grade and have things get out of control. This hand bike is 63 speeds, rear wheel drive, full suspention, all terrain tadpole trike. Front( self steering apparatus) and rear part are possible to assemble by QR. 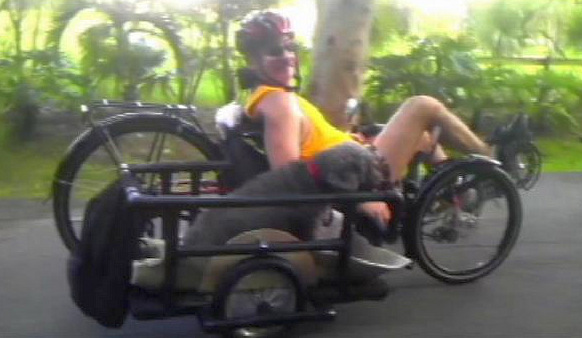 I found this video posted on Recumbent Trikes Group on Facebook where I watched it. I think it is such an excellent well done video which I thoroughly enjoyed watched that I felt compelled to share it here on this blog. I was surprised that a bicycle shop could not simply cut a longer spoke to the length needed and rethread it. That is a common practice here in America. I know of small bike shops that do this. If you would like to watch other videos of Matt’s making here is a link to his YouTube videos. Matt, I don’t know if you ever see this blog, but if you do, I just want to say thanks for sharing your adventure and I sure hope (as I know many others do as well) that you heal completely and quickly and will be able to continue your travels and we can continue to travel along with you via your great videos. CRANKING IT UP HERE, BOSS! For speed demons only. This may or may not apply to you. 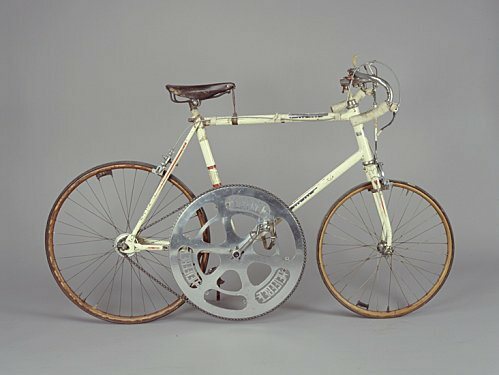 I can’t imagine riding a human powered vehicle with such a large chainring on it. This bike pictured above is said to be capable of 100 mph. I think I would have to bow out on that. Just call me chicken, but that ain’t for me. Notice the front forks appear to be turned around backwards. I assume that has something to do with more stability and better handling at high speed. What do you think? It would be intolerable trying to go up hill, but oh those downhills! One thing is for sure … it most definitely would get some attention from folks who see it. In case you are wondering I created this picture. It is not an existing trike with the large chainring. I doubt if they exist (but I may be wrong). One thought that comes to mind … this would make getting on and off the trike a bit more challenging and perhaps dangerous. One might lose the next generation if you get my point. Here is a clever innovation which would surely be a blessing to many who are bound to life in a wheelchair. This is not something brand spanking new as there are similar setups that have come along thru the years. So if you know of anyone who is wheelchair bound there are these options available for them to get out and enjoy a ride with the breeze in their faces, fresh air in their lungs and free Vitamin D from nature. I am sure most of us have noticed how difficult it is when it comes to shopping for over the counter medications such as cough syrup or pain killers. The selection has become so very massive and complex that it makes it difficult to make a selection. Even if you know what you want unless you are well acquainted with the layout of the products in the store where you are at you may struggle just trying to find it among all the many products on display. Well, the matter of taillights (and headlights) isn’t quite as bad, but it’s getting there. 🙂 Fortunately there are those who have researched and reported on their findings which can help. HERE is one such resource. I personally think that is way too much after dark. Keep in mind that after dark when around motorists it is not proper or safe to be too lit up as you can blind people which endangers them, yourself and possibly others. 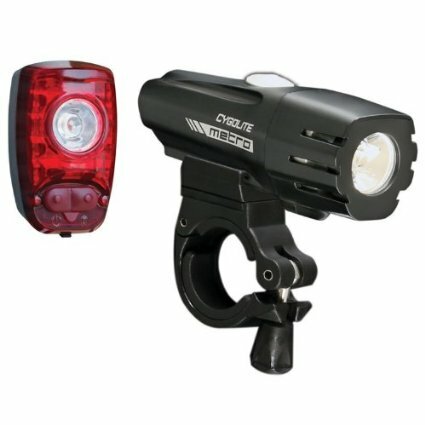 So if you are buying one of these super bright lights (taillights or headlights) you should be sure you buy one which you can dim down after dark. We need to be responsible and decent out there. 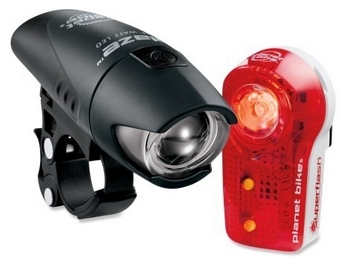 The brightness these lights offer is great in the daytime … the brighter the better as far as being seen. My Planet Bike taillights are plenty bright after dark. I would not want anything any brighter at night. It is only in daylight that I would choose more “attention getting power” (brightness). 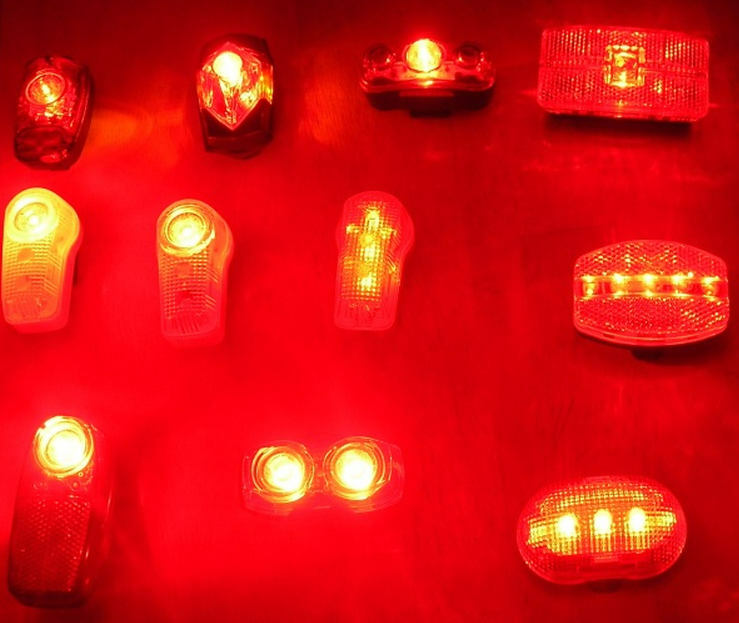 Yes, in the daylight we need bright FLASHING taillights so others can see us … along with really good SAFETY FLAGS. I think most people would tell you that I don’t appear to be too bright. 🙂 How about you? You aren’t too bright are you? I hope not. This man mentioned something I want to reiterate on. He basically said that the lights that were not as bright might be seen by someone who is paying attention, but he wants a light that gets the attention of those who perhaps are not paying attention. Now that makes good sense and something we should ponder over. I personally have long been a fan of Schwalbe tires. 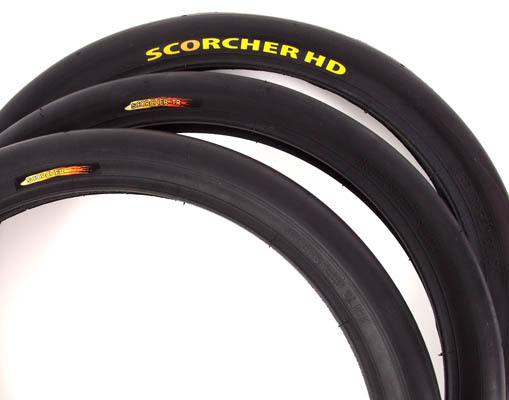 Among the offerings of Schwalbe are several different tires to choose from. My first exposure to Schwalbe tires was when I bought my Catrike Trail. When I had my first flat tire I discovered something about Schwalbe tires that I had never experienced before with any other tire. It was extremely easy to install and uninstall on the rim. This really impressed me as over the years I have had numerous tires which were much more difficult to install and uninstall. I have never known of a tire that was so easy to work with. My Catrike Trail came with Schwalbe Marathon Racers installed. When it was time to get new tires I decided to try one of Schwalbe’s other offerings as I didn’t care all that much for the Marathon Racers. Since then I have used Marathons, Kojaks, and Trykers. I had intended to try Big Apples, but when I tried the Marathon Plus I fell in love with them and have not used anything else since. I must insert here that as I stated above all of the other Schwalbe tires were easy to get on and off of the rims … in fact, they practically fall on and off. 🙂 The Marathon Plus tires are another matter. As much as I love them they are far more challenging to install and uninstall. Even so, once you learn how to do it it becomes much easier. I had started out to write this article about Schwalbe Big Apple tires, but as I researched tires I came across other brands out there to choose from. I want to state upfront that I have absolutely no personal experience with any other tires on my Catrike tadpole trike than those I listed above. Since this is true I cannot personally comment on any other tires. I will, however, report what I have read about them. I did have my homemade tadpole trike on which I installed Kenda Kwest 100 psi tires. They were ok, but not near the tire the Schwalbes are. They just aren’t in the same league. Those are definitely fat, but I am here to say that they are an entirely different animal. No, what I am talking about is a little more tame than these. 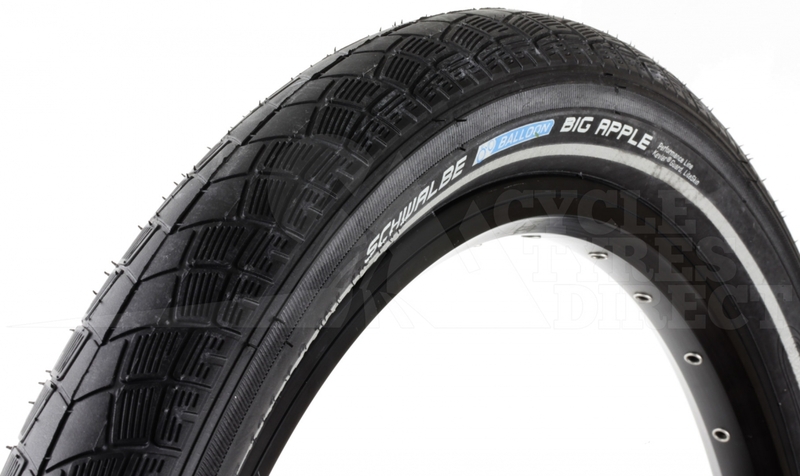 I mentioned the Schwalbe Big Apple tires so I will start off with those. They are truly reminiscent of the “balloon tires” from yesteryear which were around when I grew up. Of course, they are still available today and we see them on bicycles. The Big Apple is 2.35 inches in width. It is also available in 2.0 inch width. My trike came with 1.5 inch width tires. My Schwalbe Marathon Plus tires I use now are 1.75 inches wide. So you can see the 2.35 is quite a jump. Other than frame width on the rear the only limiting factor for wide tires I can think of is the use of fenders. On my trike the use of the 1.75 width tire required slight modification to my fender brackets. I bent them out for additional clearance. 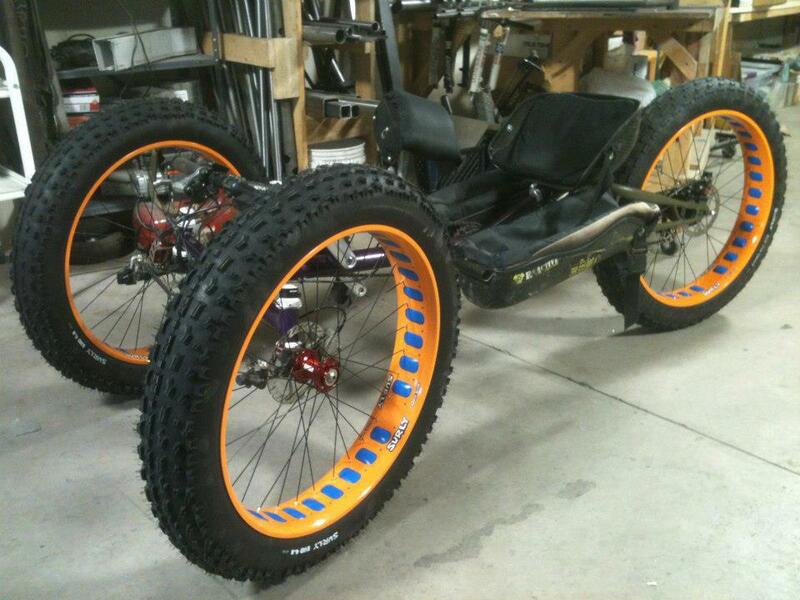 I don’t think I could install Big Apple tires on my trike without doing something additional to my fenders. The Big Apple is a 70 psi maximum tire. A common term found online when looking up the Big Apple tire is “built in suspension”. Another offering I know of is the Maxxis Hookworm tire. It is reported to be pretty tough tire. It is also a very heavy tire. 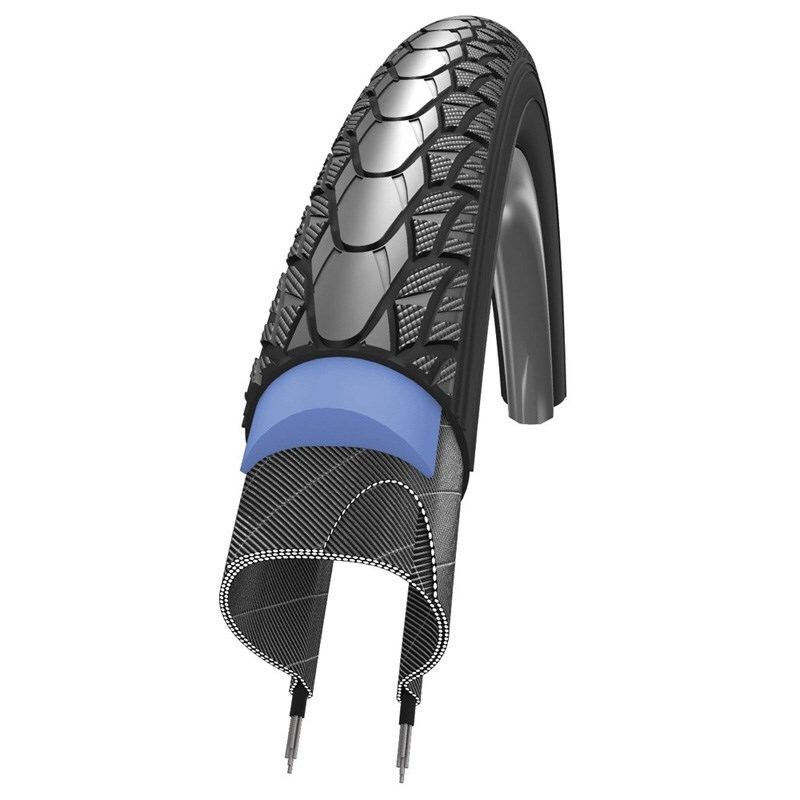 Most of what I have read about this tire is good, however one thing several people mentioned is that the rolling resistance and ride comfort is far better with the Schwalbe Big Apple tires. That stands to reason about the ride comfort since these Maxxis Hookworm tires are so tough and firm. 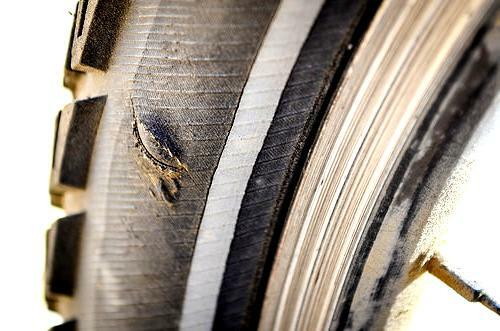 The Maxxis Hookworm is a high pressure tire capable of holding 100 psi. It is a 1.95 width. There are other tires also in the “normal” width range like what came on my trike. One of them is the Greenspeed Scorcher. This tire is 1.5 inches in width. To be fair it might be a quality control issue as even Schwalbe has had some issues with certain tires. Some users had problems/failures/disappointments and others did not. 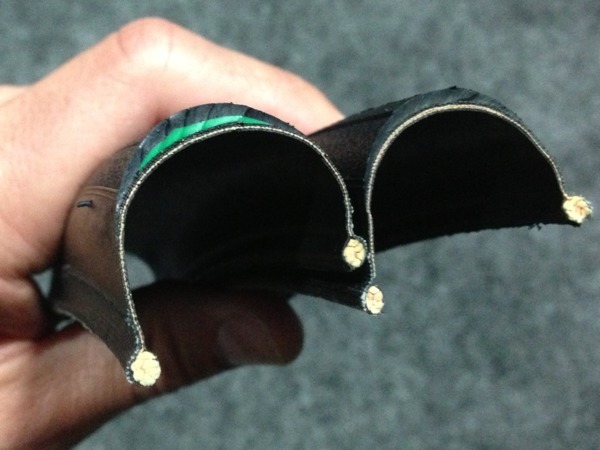 Primo makes the Comet tire with Kevlar. It is 1.5 inch width and has a maximum pressure of 100 psi. Quite a difference for sure! 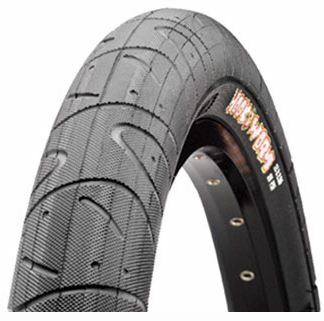 The fact that they rarely have a flat and they still ride and handle great is sufficient in itself to sell me on them, but they also wear great … I have been getting 2.5 to 3 times as many miles out of them as I did any other tires I have used. HERE is an article I wrote on the Marathon Plus tires. They not only offer excellent flat protection with this thicker belt but the rubber is a different compound than their other tires. It is just plain tougher. I used to get a lot of cuts in all the other Schwalbe tires I used. These Marathon Plus tires rarely get any cuts and they just hold up so much better. 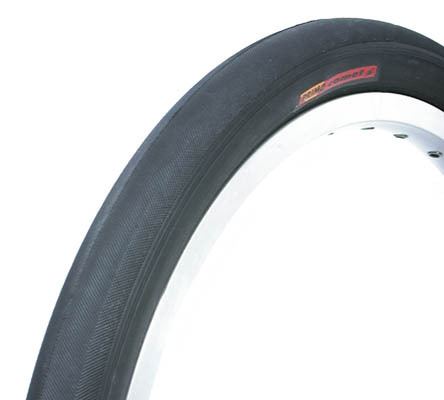 In over 13,000 miles of riding on Marathon Plus tires I have had one flat which was just recently and it was a matter of failure of the inner tube and no fault of the tire. I think it is safe to say that we have a long way to go in this area of bicycling and motorists here in the United States. I am sure most of us have experienced some really bad attitudes of motorists toward cyclists. One thing I found interesting is that young children are taught cycling in school and become proficient at it. We surely need something like that here as both children and adults all too often are meandering all over the place when they ride rather than go in a straight line staying where they should and making it much safer for everybody. Rush hour traffic here in the United States is notoriously bad in many large cities (and small ones too). What about Copenhagen? How do you suppose traffic flows there during rush hour? As you can see in the video there are not nearly as many cyclists out in that nasty cold weather but still the numbers are impressive. I go out riding in the winter when it is similar temperatures (even several degree warmer) and I rarely see another cyclists out there. We are a bunch of wimps here in America. Snow removal is an important and appreciated matter for cyclists. Here is a video showing this. I have to admit I don’t understand why they left the snow in the middle. I did spot some headlights, taillights and reflectors, but no safety flags. But when it was dark I didn’t see any lights turned on. Now that I really find that strange and don’t understand it. Finally I came across a video where I did see a few lights turned on, but most of the bikes riding along together with them did not have their lights turned on. I use mine all the time and most of my riding is in the daytime. Design is all important … giving thought to the matter and building infrastructure accordingly. I like the theme … “humans designing for humans”. I doubt if we will ever become like these folks here in America. It is interesting though. For most of us we would be living quite dangerously if we attempted to use our bikes or trikes to do our shopping. I do use my tadpole trike to run errands of various sorts. I have not only grocery shopped, but I have gone to doctor appointments, restaurants, hardware stores, etc. If you like these videos there are a few more of them available to view HERE. It would be pretty impractical to get off of a tadpole trike and walk it across intersections. I really don’t understand this video however. All the other videos show cyclists riding thru intersections and there in no mention of walking a bicycle thru an intersection except in this video. Recently on Facebook a discussion came up about riding down in Florida in which I declined as I don’t care for the heat and humidity of Florida. I am far more comfortable riding in 40 degree temperatures than in 85 or more as is common down there. I have to laugh every time I read or hear someone talk about temperatures in the upper 60s as being terribly uncomfortable for them. They are talking about the temperature falling down to that and exclaiming how cold and miserable it is. I suppose that someone from Siberia would think the same thing about my saying that -20 F. is pretty cold. I reckon it is all a matter of perspective … based on what our bodies are used to. It is said that we humans can adjust to just about any conditions. I don’t like the cold, but I can take it better than I can too much heat. I once did a little checking online to find the “perfect weather” year around. I found it, but it is nowhere near here where I live and I doubt very much if I could afford to live there. It would probably be pretty much impossible to make a living there for someone like myself relocating there. Quite honestly I no longer remember where it was. I only remember that it was a long way from Indiana. The United States is a fairly large land mass and therefore has quite a range of weather at any one time. It is obvious that we are all different and what appeals to one person does not appeal to another person. What I like someone else doesn’t like and visa versa. I reckon we just have to accept that. I have to admit that I am probably more hardy than most others around here where I live. I am out riding quite comfortably dressed wearing the same clothes I wear in the summer time and I see people bundled up in 60 degree weather far more so than I bundle up in 10 degree weather. I usually wear a short sleeve shirt and a light jacket over it when it is what I consider cold. My body produces a lot of heat when I am exercising. I sweat easily. I have friends I ride with that rarely show any perspiration on their clothing while my clothing is soaking wet.